Starting September 15, 2016 OFWs who will be vacationing and who have existing records in POEA shall be exempted from paying OEC. Previously, Filipino migrant workers pay their OEC every 2 years or when they go on vacation. 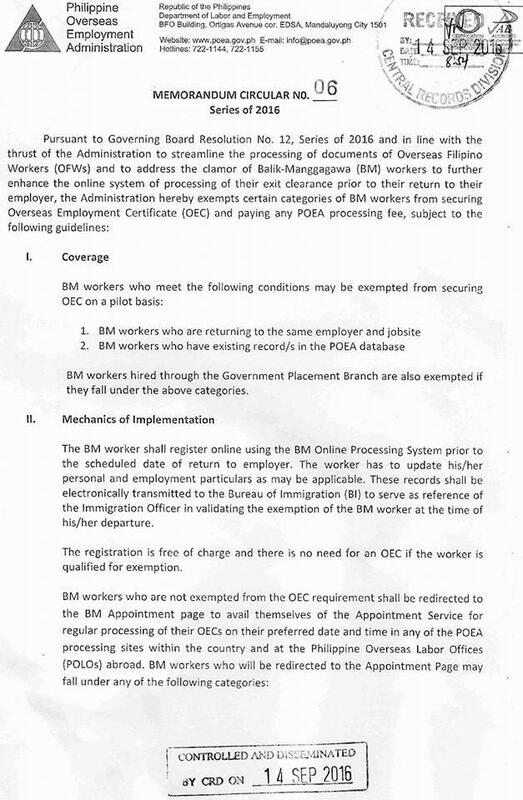 copy of POEA circular indicating workers that are exempted from OEC payment. Overseas workers who are returning to the same employer and jobsite and who have existing record in POEA shall be exempted from paying OEC. 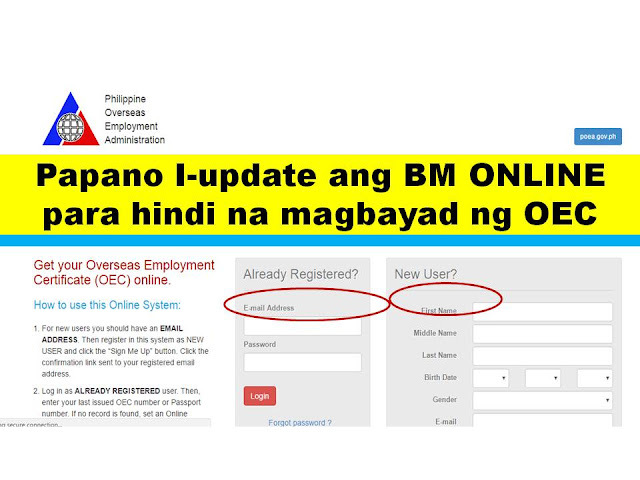 How To Update BM Online Account To Get OEC EXEMPTION? 1. 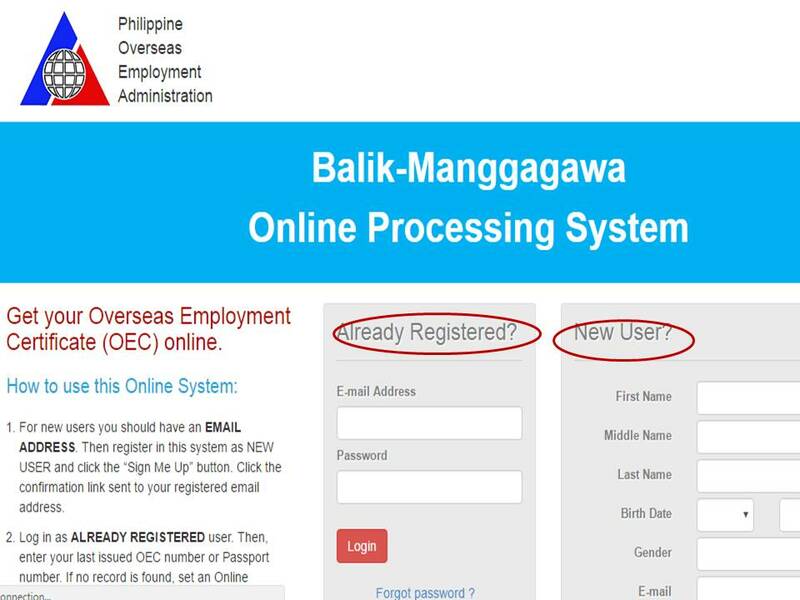 OFWs must LOG IN to their BM online processing system through this link http://bmonline.ph or visit the POEA website and click the BM ONLINE icon. 2. If you don't have BM Online Account yet, you may click on the REGISTER BUTTON and create your account by filling up the form. They will send confirmation e-mail so make sure to check and verify your account creation on your email. 3. After registering, log in your account and enter your last OEC number. If there is NO RECORD FOUND, you needed to SET AN ONLINE APPOINTMENT. 4. If there is a record found, update the information that is needed to be updated like contact number, personal detail, beneficiaries etch. 5. Once done updating, click ACQUIRE OEC or EXEMPTION for online assessment. Enter the flight details of your departure and if you will be returning to the same employer or job site. 6. If you indicate that you will be returning to the same employer and jobsite, the system will display confirmation message that you are exempted from securing OEC and paying its processing fee. 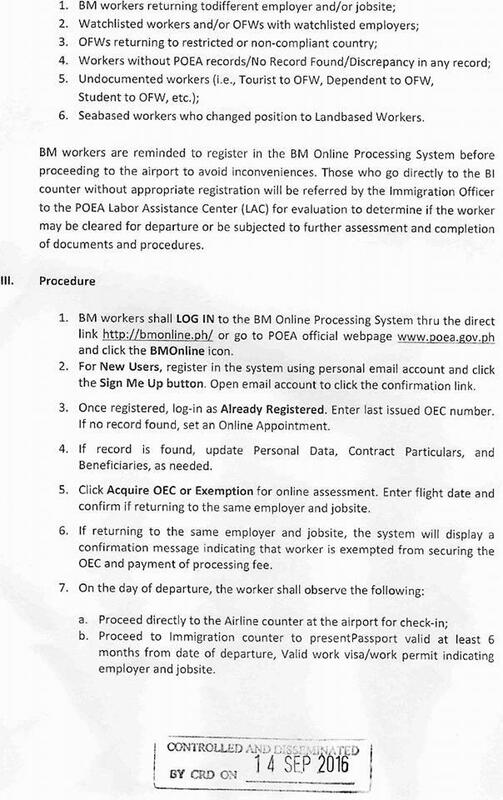 copy of POEA circular indicating the process of getting OEC exemption.